I love the way these two stamp sets work so well together. I revisited one of my all time favorite color combinations, Rose Red, Chocolate Chip and Old Olive. I have some new contemporary favs, but this combo is like comfort food for me. 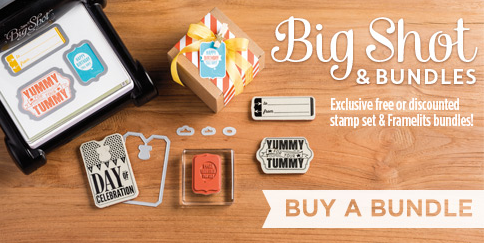 You'll receive your choice of one of five FREE exclusive Stampin' Up! stamp set and framelits bundles when you purchase a Big Shot Die Cutting Machine. That's up to a $60 value absolutely free! Do you already own a Big Shot? You can get a 15% discount on the bundles above. Please be sure to use the product numbers listed to ensure you get your discount. See all bundles, HERE. Wow, what a gorgeous card. I love the colours and the layout. Beautiful card. Love the colors and the two sets you used. This is really pretty Becky, what a lovely pairing of sets, they work so well together. Love your comfort-color-combo... too! TFS! Those are my 2 favorite sets & I love what you've done with them!! Beautiful colors! Such a stunning combination of stamp images. OMG this is gorgeous! I really want to CASE this card! The large white space just makes it POP off the card!